If food looks wonderful, chances are that it tastes as good as it looks. Our traditional five senses (sight, hearing, touch, smell, and taste) tell us what to expect from something by looks first, then by smell. Taste comes next. We don’t hear much from food unless it’s Rice Krispies. The list of five senses is credited to Aristotle. Modern science has found we have many more senses, but these are the important ones when it comes to food. It’s easy to make food look pretty. You need a sharp paring knife and a few hand tools. It doesn’t hurt if you also have a mandolin. A mandolin is a simple slicer— a blade on a base. 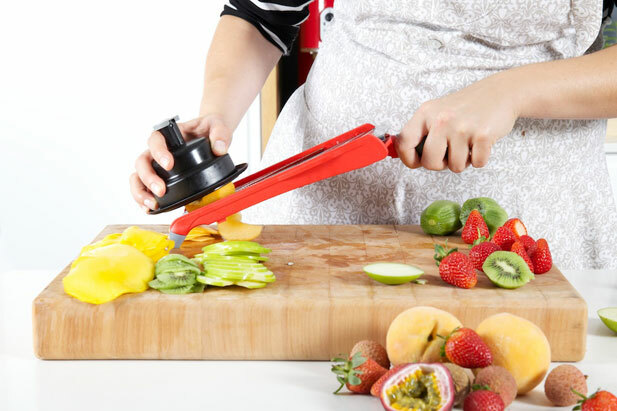 You push food over the blade and you have a slice. They come all-metal and expensive or plastic and reasonably-priced. My two are orange plastic and white plastic. Neither is expensive and both are easy to wash. The orange one includes a grating blade and one that can make waffle fries. Or waffle carrots. It can also make shoestrings and French fries. Now just before the holidays is a fine time to start experimenting making food fancy. There is a lot to work with coming from Florida farms and gardens. The Village Kitchen Shop, 257 E. Stuart Ave. in Lake Wales, (863) 679-1146, has all the tools you need— and many more gadgets besides. Let’s start with a carrot. It’s pretty just as it is. Use the fine section of a box grater (that’s the kind that’s square with four blades) to make shreds as nests for contrasting vegetables. Broccoli florets look great in an orange nest. Coarse shreds can go on salads or make a border for a platter. Never one to waste anything, broccoli stems can be grated, too, and contrast with all sorts of colorful vegetables. Frenched green beans are a pain to make. Each bean has to be sliced lengthwise and it takes ages. But a little square gadget called a bean slicer makes quick work of a long job. When you’re planning a special meal for the holidays, or just for the family, stand back at the market or produce counter and see how many colors you can find. How do they go well together? What are the natural shapes that are easy to cut? Celery tops, the parts with leaves, are pretty on a platter of devilled eggs. Flat and curly parsley dress up almost anything. Cilantro does the same thing and smells super. Grape tomatoes are nature’s Christmas tree decorations. The tree, formed on a platter, is made of broccoli, microwaved or blanched to take a little of the crispness out, and the tiny tomatoes become the balls. Tangerine shells are perfect containers for sauces or sweets. Grapefruit shells make ideal containers for dips. Green and colored peppers also make fine dip holders and the host or hostess gets to enjoy the “bowl” when the party’s over. Take about half the tops off green onions (scallions) and slice the white part lengthwise four times for a couple of inches. Put them in cold water. When you take them out the thin pieces will branch out to become onion brushes. Because we’re in Florida, we have banana leaves that can be all sorts of fun ideas. Line a bowl with bright green leaves and pile in tiny tomatoes, cauliflower florets, broccoli crowns, carrot slices, yellow squash slices, zucchini chunks, button mushrooms, and . . .
Cut the ends off a cucumber. Push a chopstick through to come out the other end. Make a cut at a slight angle at one end. Turn the cucumber while cutting to the stick. Remove the chopstick and you have a cucumber spring. Get the idea? Let your imagination go to make Florida food as pretty as it is tasty.